Melissa Krivachek talks about the importance of relationships and fun in sales and doing the little things to show people that they matter. · How Melissa got started with her first company at 19 and what she learned along the way, as well as what she is doing differently with the second company compared to the first. · See sales as fun – it’s a conversation, do something fun, make your money work for you and enjoy the things you do every day. · The importance of keeping promises and following through with what you say. · The Ultimate Sales Summit, how it got started, and the event that is coming up in October of 2018. · Drink water…it helps your complexion...raises your energy and vibration...keeps you clear and level headed....removes toxins…increases the deepness of sleep and you can get to 1 Million without it but not 10. · Consider at all times in every interaction you are making a deposit or withdrawal relationally with people. · Little things mean a lot to people. If you can create an experience for someone from start to finish, they are more likely to spend with you. · Don’t look to do things for yourself, look to do things for others and there will always be revenue there. 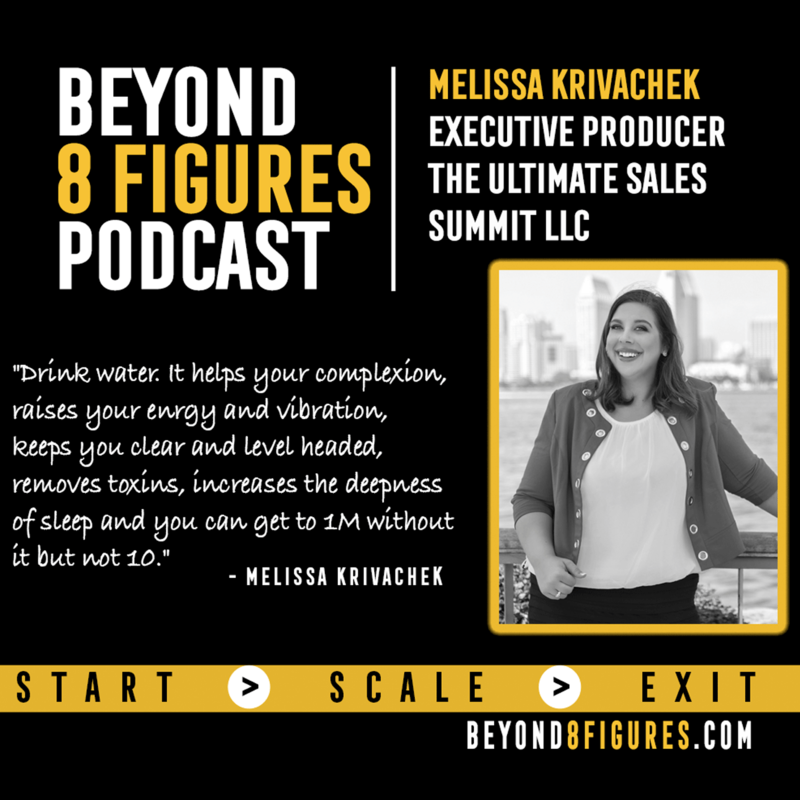 About Melissa Krivachek: At just 30 years old, as the Executive Producer of The Ultimate Sales Summit, Melissa Krivachek has 23 years of sales experience. Her passion and obsession with sales started when she was just seven years old. Since then she has been involved in every kind of sale imaginable from high ticket, door to door, cold calling and social selling generating millions of dollars in revenue while inspiring business owners to grow. Having done over 300 media appearances, Melissa has been blessed with numerous accolades including: making the front cover of Evolution Magazine as their Top Power Player under 40, being nominated for Inc. Magazine’s list of 30 under 30, being the top 1% of US Executives as awarded by The American Council of Executives in addition to multiple awards given by the state of Iowa and Minnesota for her dedication to small business and entrepreneurship. Now marking a decade in business Melissa inspires sales people and business owners through her 10 books - 7 of which are international best-sellers as well as her television show/podcast "The Millionaires Hot Seat" where she has interviewed more than 300 millionaires to date.